I am fussy about what flavors get mixed with my chocolate. Chocolate is pretty much perfect just the way it is. But coffee and chocolate are one of the perfect flavor combinations. And I was intrigued by the GoGo Beans concept. I don’t drink coffee regularly, but when I need it, I need it – and yet, I am picky about it. If I can’t get a properly made fancy coffee, I’m not one of those people who can settle for instant with non-dairy creamer (eeek! 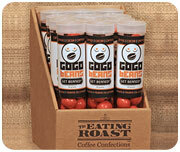 ), so a chocolate-coffee candy with extra caffeine could be a useful thing. But, it’s not a pill you just swallow – it still has to taste good. And when I got these samples, I was so disappointed, I had to get second and third opinions, just to be fair. 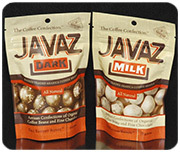 Javaz (I had the dark chocolate version) are a round chocolate candy with white splotches on the chocolate coating on the outside, and pieces of whole coffee bean inside. Going by appearance, the GoGo Bean looks like the Javaz with a candy shell, but they’re really quite different, aside from the added caffeine. The Javaz has a smaller or more chopped-up coffee bean, whereas the bean in the GoGo Bean is whole. And the GoGo Bean does not have chocolate in the ingredient list – it is made with cocoa powder – whereas the Javaz is made of actual chocolate. Biting into the GoGo first tastes like an M&M then turns into coffee bean flavor. My second tasting assistant said the shell didn’t have the flavor she dislikes that she usually associates with reddish colors of M&Ms. All three of us agreed that the GoGo Beans were superior, but neither one of these were something that I would eat again, or even wanted to finish a free package of. However, both of my coffee-addict assistants were happy to take the rest of a tube of GoGoBeans to work with them, so if you’re looking for a convenient chocolaty source of caffeine, you might want to give them a try.